... Rice Dream Vanilla Pie frozen dessert and knew I had to give it a shot. 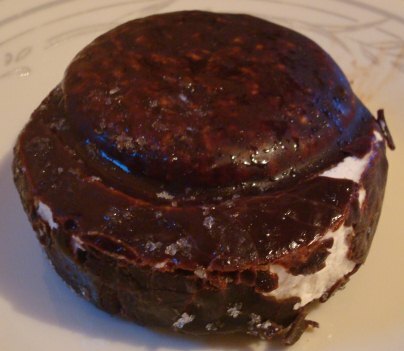 The difference between this one and the chocolate one I tried is not just the filling flavor but also the fact that this one is covered in carob instead of that bland chocolate. That was one of the main reasons I decided to pick this one up. For those who don’t know Carob is a powder made from the carob pod and it's commonly used as a substitute for chocolate. Some people claim that it is healthier than chocolate because carob contains 3 times more calcium than chocolate but it also lacks the antioxidants that chocolate has. I’m no expert so take that as you please. It is also supposed to be less flavorful than chocolate but there’s no way this could have less flavor than the chocolate on the other varieties of these out there. Out of the wrapper you can see the carob has seemed to chip off in places. This gave me the opportunity to sample it alone. Well the taste is interesting to say the least. 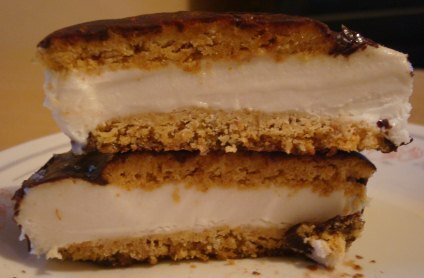 I really can’t describe it but it is unique and a step up from the chocolate coating on the other pie. Cutting it in half, there was a good amount of resistance and I actually heard a crunch this time so we’re off to a good start. Biting in, I got that crunch that I was hoping for from the carob coating. There’s a slight earthiness coming from the carob which mixes well with the oatmeal cookies. The vanilla rice dream was nonexistent in the flavor department though. 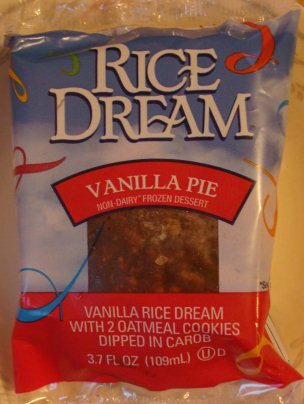 I’m not sure if it’s the cookies that are masking the flavors of the rice dream or they truly are that bland because when I tried to sample it alone I still didn’t taste much. One redeeming quality of the rice dream was that it was once again creamier than I had expected. Still the combination of the carob coating and the cookies made for an interesting taste to say the least. This one does suffer from the lack of sweeteners just like the chocolate pie did. The oatmeal cookies could definitely use some added sugar as well and some spices wouldn't hurt either. Oddly I kind of feel like this treat is growing on me the more I make my way through it. Now I’m not saying this is a great product but it is a nice change of pace. If you’re trying to avoid dairy for whatever reason, I’d easily recommend these over the chocolate version. Buy Again? Possibly but I think I’ll try one of their pints before I get one of these again.